Many women rely on SPF moisturisers to keep their skin hydrated, reduce their risk of cancer and keep them looking young. But a study suggests these lotions may fail to protect us against skin cancer. Researchers from the UK suggest 16.6 per cent of the face is missed when we apply creams with added SPF. 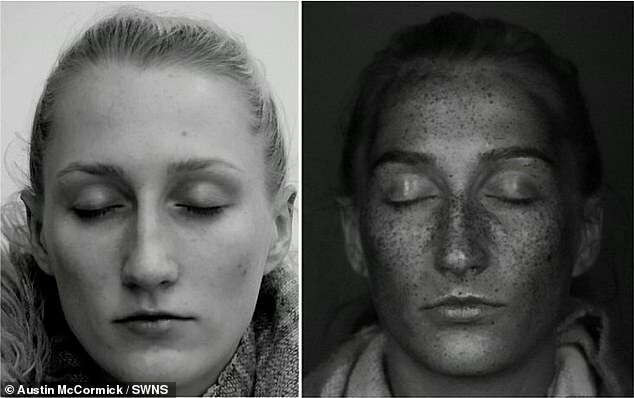 This is compared to just 11.1 per cent of the face being missed when using conventional sunscreen. A difference in the consistency of the cream or packaging between the products may be to blame, the scientists said. They worry many of us may be overindulging in the sun without realising vulnerable areas of our face are unprotected. The research was carried out by the University of Liverpool. It was co-led by Kevin Hamill, a lecturer in eye and vision science, and Austin McCormick, a consultant ophthalmic and oculoplastic surgeon. ‘Participants covered a smaller area of the face when using moisturiser compared to sunscreen,’ the authors wrote in the journal PLOS ONE. Skin cancer is on the rise despite global initiatives to drive SPF use, the scientists wrote. Although daytime moisturisers with added SPF are convenient, the researchers worry these are not being applied in a way that provides ‘sufficient protection’. To put this to the test, 21 men and 62 women were told to apply either Olay Regenerist 3 Point Moisturiser SPF 30 or Soltan sensitive hypoallergenic suncare lotion SPF 30. Both products recommend users avoid their eyes but do not mention eyelids. Squamous cell carcinoma (SCC) is the uncontrolled growth of abnormal cells in the upper layers of the skin. It often looks like scaly red patches, open sores, elevated growths with a central dip or warts, all of which may crust or bleed. They can become disfiguring or life-threatening if allowed to grow. More than one million people are diagnosed with SCC every year in the US. Its UK prevalence is unclear. SCC is mainly caused by overexposure to UV light from the sun or tanning beds. Although SCC can occur anywhere on the body, it is most common on areas exposed to the sun, such as the face and hands. SCCs spotted at an early stage and removed promptly are mostly curable and cause minimal damage. Treatment typically includes surgery to remove the growth, as well as radiotherapy and topical drugs. 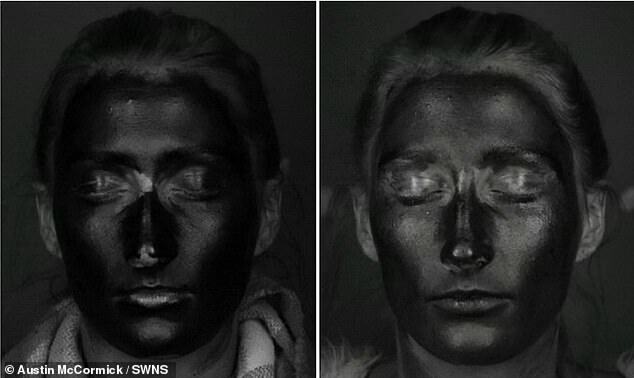 The participants – who were aged between 18 and 57 – were then exposed to ultraviolet radiation and photographed via a UV-sensitive camera. The experiment was repeated with the participants who initially wore the sunscreen applying moisturiser and vice versa. Results revealed the participants failed to apply the moisturiser to 16.6 per cent of their faces. This was compared to just the 11.1 per cent that was missed when using sunscreen. Eyelids were the most forgotten, with 20.9 per cent of the delicate area being missed when moisturiser was applied and 14 per cent missed when sunscreen was used. 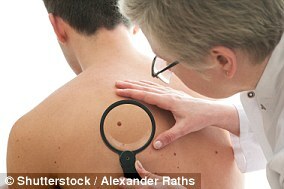 The findings were concerning given that skin cancers most commonly occur on the head and neck, the researchers wrote. And eyelids have the highest incidence of the disease. ‘We conclude that particular attention should be paid to the eyelid area when applying any SPF cream,’ the authors wrote. And 78 per cent of the participants failed to protect the area between the corner of their eyes and their nose, regardless of whether they were applying sunscreen or moisturiser. In fact, only five of the participants covered this area in both experiments. This is concerning given that the area between the eyelid and the nose is particularly vulnerable to basal cell carcinoma, making up more than 80 per cent of cases. A questionnaire completed by the participants after the experiment revealed most were unaware they had insufficiently applied the sunscreen or moisturiser. When faced with the statement ‘I applied (sunscreen or moisturiser) to all areas of my face’, 77 ‘agreed’ or ‘strongly agreed’ when it came to the sunscreen. And 73 had the same response concerning the moisturiser. But when the participants were shown the photographs that revealed their UV exposure, more than half answered they ‘disagreed’ or ‘strongly disagreed’ with the statement. The researchers worry that while NICE recommends moderate sun exposure to keep our vitamin D levels topped up, believing we have sufficiently applied SPF may encourage us to spend too much time in the sun. Unprotected areas will then receive ‘increased cumulative UV doses’, they wrote. They added: ‘Alternative methods of protecting the eyelids should be considered such as UV filter sunglasses. The scientists hope their study will lead to public-health messages that encourage us to protect our delicate eyelids. An Olay spokesperson said: ‘At Olay we use SPF in our skincare for daily protection and recommend it is applied across the whole of the neck and face including eyelids. ‘However we do not recommend it as a replacement to the higher SPF protection products available if intending to spend longer periods of time in exposed sun, such as sunbathing.